Designed specifically to remove harmful contaminants from environmental tobacco smoke (ETS), the Airpura T600DLX features a specialized TarBarrier pre-filter to remove tars, as well as an extra large 3" super enhanced impregnated activated carbon bed (26 lbs or carbon!) to remove most known chemicals and gases found in tobacco smoke, including at least 60 confirmed carcinogens, and enhanced VOC reduction. A HEPA-grade post filter removes airborne particulate. 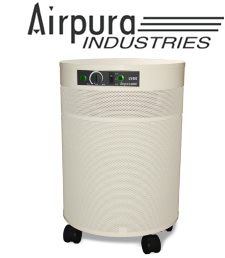 The Airpura T600DLX is equipped with a 560 cubic foot per minute variable-speed fan with a one-piece assembly to reduce vibration and noise, felt gaskets to prevent contaminant bypass (many competitors use rubber seals that off-gas VOCs), and an attractive powder-coated steel mesh housing with 360 degree intake. The Airpura 600 series has one of the highest air processing rates in the industry, however, noise level from the fan remains well below competitor's models with less air flow. The T600DLX is recommended for spaces up to 2,000 square feet, however, it is important to keep in mind that due to the high rate of re-contamination in smoking areas, a high air turnover rate (at least 6 times per hour) is generally preferred. This unit will clean roughly 700 sq ft. 6 times per hour. Filter lives estimated below are highly dependent upon level of smoke. Although this unit is designed specifically for demanding smoke removal tasks, extreme smoke levels will reduce filter life and unit performance. Home use will generally result in longer filter life than stated below. Recommended Application: The Airpura T600DLX is an excellent choice for homeowners who smoke, for dedicated workplace smoking areas, restaurants, bars, and other locations where tobacco smoke is the primary air quality concern. Amount of Carbon 26 lbs. Airpura T600DLX is backed by an impressive manufacturer's 5 year parts replacement, and 10 year labor repair warranty.